Kickstarter Success! 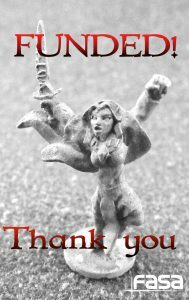 – FASA Games, Inc.
Our kickstarter for the Elf Army Book has been successfully funded! Thank you so much to all who participated and helped back the project. We are placing the last few pieces of art and making a few final adjustments before we have a draft that’s ready for you to look at, but we are hoping to be able to offer a preview soon. Our backers will have the first look, of course, but I’m hoping I can get out a sneak peek to the rest of you soon. With any luck, the book will be ready in PDF form in the next few weeks and ready to order in print soon after that. If you’re not a part of the Kickstarter but are still itching to get a head start on your army, you can visit the Fasa Games e-shop where we have the Elf U18 figures ready to purchase. You can also find the Dwarf and Thain figures there with their respective books all ready to go. The future of Demonworld sees the armies of the Isthak on the horizon. The Ice Witches, Beastmen, Warlocks, necromancers, and Ice Giants are sharpening blades and gathering their power for an assault on the rest of Tinére. Rhagai himself has nefarious plans in place that will make life very difficult for the disparate races on the continent. You’ll just have to stay tuned to find out what they are. Thank you again for sticking with us and for all your support. We are privileged to be able to make these games for you and are quite excited to bring you more in the coming months and years.